Photo courtesy of Matthew Wheaton Veterinarian Matthew Wheaton and his wife Blythe met at the dog park; both had pets rescued from shelters. Together, they have started a rescue center to give other pets a better chance of finding a home. Last year veterinarian Matthew Wheaton met Crystal, a nine-month old black Lab puppy who was brought to his Laguna Hills clinic after vomiting for three days. She had a high fever, severe dehydration and septic shock. X-rays also showed an obstruction in her intestines. To recover, Crystal would need emergency surgery. The tab would be thousands of dollars, which the owners could not spare. Crystal was euthanized, even though her condition was treatable. Her owners were a typical middle-income family, who loved their pet, but were financially unprepared for this unforeseen crisis. While Crystal's owners grieved and shed many tears, Wheaton felt a different emotion, visited again by a compulsion to help people like Crystal's owners. In May, the Laguna Beach resident will begin to realize his goal to make the world a better place by saving "one dog at a time, one cat at a time." He recently founded the nonprofit Pet Rescue Center to reduce the number of adoptable pets being euthanized in Orange County shelters and to help responsible pet owners who cannot afford life-saving treatments for their animals. Wheaton and his wife, Blythe, who is the center's development director, had been circling the idea of some sort of pet charity for a while. It was when Wheaton decided to move his practice, Alicia Pet Care Center in Laguna Hills, to a newer and larger facility that their idea came to fruition. "I felt really bad to walk away from it all," said Wheaton, referring to his old space, which was still in good condition and well equipped. Instead, they decided to give rein to their charitable impulse and renewed the lease on the old facility but with a new purpose as a Pet Rescue Center. "If the animals could talk they'd be applauding their little paws," said Diane Klein, president of New Beginnings for Animals in Mission Viejo, one of many independent rescue groups in the county that is looking forward to collaborating with the Pet Rescue Center. Wheaton is "setting a new standard," she said, by taking in pets other rescue groups can't accommodate and helping to remove animals off "death row" at over-burdened public shelters. "The rescue industry is just thrilled with what Matt Wheaton is doing," said Klein, whose New Beginnings can take in no more than 20 cats and fiveor six dogs at a time. Up to 20,000 pets are euthanized in Orange County animal shelters each year, estimated Wheaton. While some of the animals might be considered unfitfor adoption because of aggression or behavioral issues, many are quite adoptable. The problem is a lack of space for abandoned and impounded animals in the overburdened larger shelters. The Orange County Animal Services shelter in Orange impounds more than 30,000 animals a year. The shelter's kill rate is more than 40 percent, compared to a kill rate of less than 10 percent at city shelters such as those run by Irvine, Mission Viejo, Laguna Beach and San Clemente, according to Jim Gardner, who leads the South County Animal Shelter (SCAS) Coalition, established due to the lack of pro-humane animal shelters in Laguna Hills, Aliso Viejo, Lake Forest and Rancho Santa Margarita. Wheaton needs little more than a coat of paint and a new sign before opening the center, as scheduled, in May, once he moves his practice to its new location a mile down the road. But generating $6,000 a month in rent through pet adoption fees alone may be no easy trick. That's where fundraising comes in. For starters, Wheaton is putting pressure on drug and veterinary food suppliers to support the effort. He has already succeeded in getting them to foot the bill for Providing Shelter, a fundraiser at Zinc's in Laguna Beach on Saturday, April 5, from 7 p.m. to 11 p.m. Their goal is to raise $50,000 through ticket sales, an auction, sponsors and donations. Entertainment will include local gypsy jazz guitarist Tommy Davy and artist Patrick Moran. Wheaton's plan is for the Pet Rescue Center to coordinate with local nonprofit rescue groups such as New Beginnings that already do much of the leg work to rescue adoptable pets from imminent death at kill shelters. There is little networking between the various rescue groups. The center could serve as a pet-rescue clearing-house. "We're there to make everything more efficient," said Wheaton. Rescue groups depend on fees from adoption and they don't want to lose income crucial to their survival. Often, though, they can rescue more pets than they can accommodate - usually through private foster homes. In such a situation, they could bring the overflow pets to the PRC, which will accommodate up to 40 animals at a time and where the storefront location offers higher visibility. Rescue groups will be able to place pets at the rescue center free of charge for 30 days. The center will also spay, neuter and vaccinate the pets without charge. If a pet isn't adopted in 30 days, PRC will give the rescue group 14 days notice to move the pet. "We have to have turnover," explains Wheaton, whose goal is to findhomes for 700 animals a year. "That's the only way it can be successful. We have to have highly adoptable pets come in and go out quickly." The PRC hopes to lure a full complement of volunteers to help with walking dogs, cleaning kennels, playing with and caring for cats and dogs, and help with fund raising and publicity. Of course there will be no vet fees, because Wheaton will donate his services pro bono. Even before this venture, Wheaton has been reaching out to rescue groups, providing 50 to 70 percent off veterinary care and also giving them cards to hand out to adopters that offers 10 percent off veterinary care, medication and supplies for a year from the date of adoption. He also offers a free first exam to adopted pets. Wheaton is equally passionate about the grant-giving arm of the PRC that will work with Orange County veterinarians in cases where a pet has a life-threatening but treatable condition that the owners are unable to afford. When an owner can't afford the treatment to save their pet's life, one of three scenarios usually ensues, Wheaton said. Either the owner simply takes the pet home where it presumably dies, the pet is euthanized at the vet's office,or the vet takes custody of the pet and performs the treatment pro bono, but typically finds an alternate home. The hardest cases involve responsible owners who cannot afford a life-saving treatment for their pet. In such a situation, Wheaton hopes other vets will contact the PRC to suggest a candidate for a grant, and, funds permitting, the PRC would pay for the treatment. 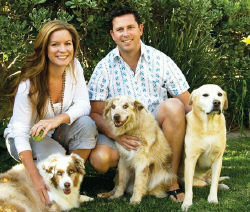 Wheaton is a second generation veterinarian who grew up in Laguna. He and his wife met at the Laguna Beach Dog Park. After that fateful first meeting, each told the first person they saw that they had just met the person they'd marry. They've been together ever since. Now, with two small children and three dogs, they are ready for the next adventure.